Heart disease is a broad term covering many conditions that prevent the heart from working properly to pump blood throughout the body. A coronary artery showing (left) moderate atherosclerosis and (right) severe atherosclerosis. that he had experienced a mild heart attack. A nurse told Max that his quick action might have saved his grandfather's life. Heart disease is a group of diseases that prevent the heart from working as well as it should. Only a little larger than a fist, a normal, healthy heart is at the center of the body's cardiovascular system * . Each day the average heart beats, or expands and contracts, about 100,000 times. In a 70-year lifetime, an average human heart beats more than 2.5 billion times. The circulatory system * is responsible for providing nourishment to the body's cells and removing wastes from them. The arteries take oxygenated blood from the heart to the cells; the veins take blood from the cells to the lungs for reoxygenation and recirculation by the heart. The coronary arteries encircle the heart from above and below like strands of ivy. With their strong, flexible walls and smooth linings, healthy coronary arteries supply blood to the heart itself, in much the same way as a hose transports water to a garden. At birth, these coronary arteries are completely open and dear, permitting a maximum flow of blood to the heart, but as people age, these vessels can become clogged with a thick combination of lipids (fats), cholesterol, calcium, and other substances. As these layers accumulate inside the arteries, they can lead to arteriosclerosis (ar-teer-e-o-skle-RO-sis), a condition also known as "hardening of the arteries," since this buildup eventually stiffens the inner artery walls. Atherosclerosis (ath-er-o-skle-RO-sis), a buildup of plaque * on the innermost portion of the vessel, is the most common form of arteriosclerosis. Over time, plaque continues to accumulate in the blood vessels, much like grease that clogs a kitchen drainpipe. The result is a narrowing of the inside diameter of the vessel. Coronary arteries affected by atherosclerosis will eventually develop coronary artery disease, a condition in which the vessels are so narrow that they can no longer provide adequate nutrients or oxygen to nourish the heart. Blood flow is blocked either partially or totally. 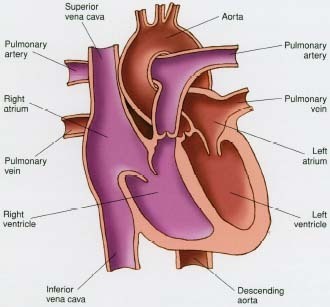 * cardiovascular system (kar-deeo-VAS-ku-lur) is comprised of the heart and blood vessels. 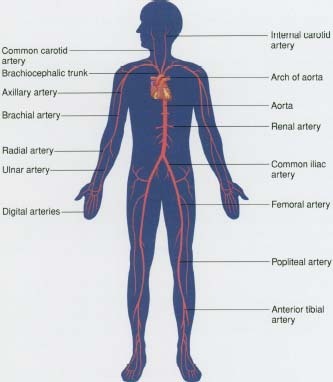 * circulatory system (SIR-ku-la-tor-ee) is made up of the heart, arteries, veins, capillaries, and circulating blood. * plaque (PLAK) is a raised patch or swelling on a body surface. Arterial plaque occurs on the inner surface of an artery and is produced by fatty deposits. During a heart attack, the flow of blood to the heart is blocked by atherosclerotic plaque or dots, causing tissue death in the areas deprived of oxygen. of the arteries by atherosclerotic plaque, by a blood clot blocking the narrowed vessel, or by a contraction (spasm) of the artery in response to a lack of oxygen or blood. The part of the heart muscle affected by the blockage is usually slowly starved of oxygen. The longer the heart muscle goes without nourishment, the more muscle tissue deteriorates or dies. Quick action, like that taken by Max, is essential. Blocked arteries are not the only cause of heart attacks. Hypertension, or high blood pressure, can be a contributing factor. Pumping blood against high pressures in the blood vessels (as occur in people with uncontrolled hypertension) can put too much strain on the heart. Abuse of alcohol, viral infections, tuberculosis, parasites, or other vascular (blood vessel) diseases can also lead to heart disease. Diseased valves can also put abnormal strain on the heart. The four valves, located between the atria (upper chambers) and ventricles (lower chambers) of the heart, open and close like tiny camera shutters to make sure that blood flows in the right amount and in the right direction. If a valve is scarred and cannot open completely, the heart has to work harder to pump enough blood through the obstruction. A valve that does not close completely can allow blood to go backward through the heart chambers, making the heart work harder by having to pump the same blood twice. Bacterial endocarditis, or inflammation of the endocardium (the inner surface of the heart), is an infection that can cause the heart valves to malfunction. Such an infection may rarely follow oral surgery or dental work, when normally harmless bacteria are released into the bloodstream. This generally affects valves that were previously damaged from rheumatic heart disease or other conditions. Various forms of heart disease can also cause dysrhythmias (dis-RITH-me-as), or disturbances in the normal heartbeat pattern. Although many of these are harmless, some are quite serious. For example, ventricular fibrillation (ven-TRIK-yoo-lar fib-rill-AY-shun), a type of heart rhythm in which pumping is uncoordinated and ineffective, can cause sudden death. Age. As people age, their cholesterol levels usually increase and hardening of the arteries appears and progresses in most people. Gender. Men have higher cholesterol levels than women until around age 45. Women catch up after menopause * . Family histories. People with a family history of heart disease are at increased risk. * risk factors are things about people, such as their age, weight, or diet that increase their chances of getting a certain disease. * menopause (MEN-o-pawz) is the time of life when women stop menstruating (having their monthly period) and can no longer become pregnant. The recommended BMI is 20 to 26. The overweight range is 26 to 27.3 for women and 26 to 27.8 for men. Most "experts" say that obesity begins with a BMI greater than 27.3 for women and 27.87 for men. All agree that anyone with a BMI over 30 is obese. Smoking. Smokers' risk of heart attack is almost twice that of nonsmokers, and their risk of sudden cardiac death is two to four times that of nonsmokers. Quitting (or never starting!) is a definite heart-healthy move. High blood pressure. Hypertension puts extra stress on the heart. Taking medication to lower high blood pressure, maintaining healthy body weight, avoiding salt, and increasing exercise can help people reduce blood pressure. Blood lipids. Lowering fats in the blood, such as cholesterol, can reduce the risk of heart disease. Individuals who come from a family with heart disease; who have other risk factors such as smoking, diabetes, hypertension, obesity, or physical inactivity; or who have a parent with a high cholesterol level should have their lipid levels monitored by a doctor. Diabetes. Many people with diabetes have high blood pressure or are obese. Diabetes can also increase lipid levels and accelerate the development of atherosclerosis, heart attack, and stroke. Obesity. Obesity is generally defined as having an adult body mass index greater than 27 (see sidebar). About one third of American adults are obese, even though maintaining a healthy weight throughout life seems to be one of the best ways of living longer and healthier. In a famous 30-year study of 5,127 adults in Framingham, Massachusetts, between 1948 and 1978, those who maintained their weight from age 25 on had a lower risk of heart disease. Those who lowered their weight over this time reduced their risk even further. Physical activity. Exercisers have a lower rate of cardiovascular disease; those who are inactive have a higher rate. Aerobic exercise * lowers the heart rate, lipid levels, and blood pressure and decreases body fat. Such activities include brisk walking, running, swimming, rowing, and jumping rope for at least ten to fifteen minutes. It is estimated that 60 percent of American adults get no aerobic exercise. Other risk factors that can be controlled include drinking too much alcohol and having too much stress. Cholesterol (ko-LES-ter-ol) is a soft, waxy substance that circulates in the blood and is found in every cell of the body. It is an important building material for cells and nerves and is used for the production of certain hormones. Cholesterol is used by the liver to make bile acids, which help digest food. Triglycerides (try-GLIS-erides) are fats in the blood that, like cholesterol, can come from either the diet or can be produced by the liver. Triglycerides are different from cholesterol, but like cholesterol, they are normally present in the blood. Elevated triglycerides may be associated with certain illnesses. The body makes all the cholesterol it needs, but people also get cholesterol from their diets, particularly when they eat foods made from animal and dairy products. High blood cholesterol levels can have many causes, including genes (heredity) and lifestyle choices (diet). Too much cholesterol can lead to coronary heart disease. Hyperlipid disorders, in which there is too much cholesterol or too much triglyceride in the blood, are some of the most common inherited conditions in humans, affecting one in every 500 people. In persons with such disorders, risk factors such as obesity, cigarette smoking, and high blood pressure can increase the chance of coronary heart disease even further. How Do People Know They Have Heart Disease? Heart disease is the number one killer in developed countries, and heart attacks are recognized as the most obvious sign of heart disease. Each year, 1.5 million Americans have heart attacks. But one problem with heart disease is that in 20 to 40 percent of people (like Max's grandfather), a heart attack is the first symptom of the disease. By then, plaque may have narrowed one or more arteries, limiting their ability to supply an area of the heart muscle with the oxygen and nutrients it needs. * aerobic exercise (air-O-bik) is exercise designed to increase oxygen consumption by the body; it helps keep the heart and lungs in shape. Almost 60 million Americans have some form of cardiovascular disease. The most common condition is high blood pressure, which affects 50 million Americans. Heart disease killed 944,148 people in the United States in 1997, making it the leading cause of death. It accounts for about 40 percent of all deaths each year in America. About 84 percent of heart disease deaths occur in people who are 65 and older. Heart disease also is a leading cause of death worldwide. The World Health Organization reports that in 1998, for example, 32 percent of all deaths (16.7 million) resulted from heart disease. It was the number 1 cause of death in all regions of the world, except Africa (where it was ninth) and the western Pacific (where it was third). WHO predicts that worldwide heart disease death rates will climb during the next two decades if developing nations continue their trend toward increased smoking and more westernized diets. Because a heart attack can cause severe damage by robbing the heart of oxygen, a quick reaction to the earliest signs of a heart attack is essential. Angina pectoris (an-JY-na PEK-to-ris), a squeezing, tightness, or heaviness in the chest that can extend to the left arm, neck, jaw, or shoulder blade, is often the first sign that someone with atherosclerosis is at risk for a heart attack. Physical exercise, a heavy meal, strong emotions, or extreme temperatures can bring it on. If angina occurs when a person is at rest, this means that the heart is starving for oxygen even when it is not working hard. Besides chest pain, weakness, fainting, profuse sweating, nausea, and vomiting can accompany a heart attack, although a heart attack that arrives without angina—a "silent" heart attack—may not be revealed until a patient shows up in the physician's office for an unrelated condition. Valve disease can cause related symptoms of dizziness, fatigue, weakness, shortness of breath, and chest pain when exercising. These same signs, along with edema (e-DEE-ma), an accumulation of fluid that occurs when the heart cannot keep the circulation moving properly, can indicate heart failure * . Gravity often pulls the fluid downward, causing swelling in the feet, ankles, and legs. Depending on the type of heart disease, a physician can use a number of different tests to help pinpoint heart problems. They are divided into invasive tests done internally and noninvasive tests that can be performed externally. Electrocardiogram (ECG or EKG). A recording of the heart's electrical activity to help a doctor diagnose and monitor irregular heart rhythms, heart attacks, or other abnormalities. A portable ECG machine worn by a patient called a Holter monitor can also test the effectiveness of drug therapy for dysrhythmias and monitor pacemaker * functions for 12, 24, or 48 hours. Stress test. An ECG performed during exercise to determine the cause of chest pain and other symptoms related to physical activity. Echocardiogram. Ultrasonic waves, or high-frequency inaudible sound waves, are bounced off the surfaces of the heart and converted into an image that can be displayed on a monitor to diagnose congenital * heart disease, valve disease, congestive * heart failure, and other conditions. Ultra-fast computed tomography. Scanning that employs electron beams to detect calcium deposits in the coronary arteries. * heart failure is a medical term used to describe a condition in which a damaged heart cannot pump enough blood to meet the oxygen and nutrient demands of the body. People with heart failure may find it hard to exercise due to the insufficient blood flow, but many people live a long time with heart failure. * pacemaker, a device whose function is to send electrical signals that control the heartbeat. The heart's natural pacemaker is the sinoatrial node, a special group of cells. Sometimes it is necessary to implant a battery-powered pacemaker that sends small electrical charges through an electrode placed next to the wall of the heart. * congenital (kon-JEN-i-tul) means existing at birth. * congestive (kon-JES-tiv) means characterized by accumulation of too much fluid. Doctors use electrocardiograms to monitor heart rhythms. Compare the healthy heart rhythm (left) to heart rhythm during a heart attack (right). © 1984 Martin M. Rotker/Photo Researchers, Inc.
Arteries in the circulatory system. an arm or leg artery. A contrast solution (a dye that will show up on film) is then injected to visualize the blood vessels on film (angiography). Depending on where the catheter is positioned, it can diagnose the extent of coronary artery plaque buildup or abnormalities of the aorta * and valves. Although many heart conditions cannot be cured, they can be controlled with lifestyle changes, medication, or surgery, or a combination of these strategies. * aorta (ay-OR-ta) is the major large artery that carries blood from the heart to the rest of the the body. Irregular heartbeats, heart failure, and angina are often treated with a combination of healthy lifestyle changes and medications. One of the most common medications used is nitroglycerine (ny-tro-GLIS-er-in), in the form of a tiny pill dissolved under the tongue, which acts to open the heart's blood vessels and permit more oxygen to flow to the heart muscle. Beta-blockers decrease the heart's demand for oxygen by slowing down the heart rate. Aspirin, which helps keep the blood from clotting easily, is given to people who have heart disease or a high risk of heart disease to decrease the likelihood of blood clots and thereby lowers the risk of heart attack and premature death. At the time of a heart attack, patients may be given special clot-dissolving medications intravenously (injected into a vein) to help unclog the diseased coronary arteries. Medications are also used to control high blood pressure. Angioplasty (AN-je-o-plastee), also called balloon angioplasty, opens up vessels blocked by plaque buildup. A specially designed balloon is threaded through an artery. Once positioned, the balloon is set at the narrowest portion of the blocked artery and inflated, pumping up and widening the channel. After the artery is opened, the balloon is withdrawn. 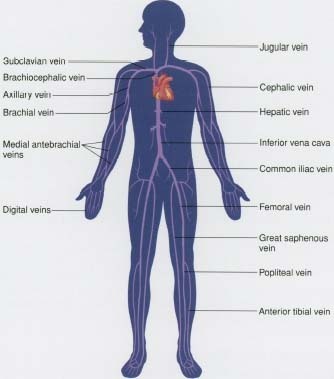 Veins in the circulatory system. 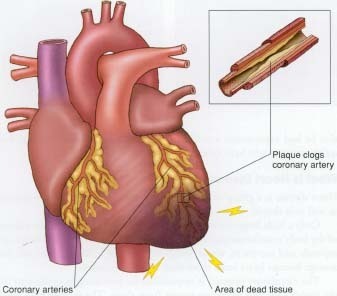 patients whose arteries suddenly collapse or spasm (contract) and close during angioplasty, setting off a heart attack. Atherectomy (ath-er-EK-to-mee) is the excision (cutting out) and physical removal of plaque from arteries. It is used in place of or along with balloon angioplasty. Once the balloon is inflated, a miniature cutter whirs forward to scrape deposits from the wall of the vessel like a tiny rotor clearing a clogged drain. Debris is pushed to a special collection chamber, and when the device is withdrawn, the debris comes with it. Pacemakers can be inserted to restore a regular heartbeat. Advanced devices can sense and respond to changes in body movement, temperature, and breathing rate. Bypass surgery is a procedure in which a segment of vein taken from the leg or an artery from the chest is grafted to an opening in the side of the normal coronary artery above the obstructed (blocked) segment and then to the normal portion of the artery below the obstruction. Blood then "bypasses" the obstructed segment, much like taking a road detour around a construction site. Damaged valves can be replaced with mechanical valves made of plastic or Dacron or a biological valve taken from a pig, cow, or human donor. Cardiac transplantation is the most dramatic means of treating patients with severe heart failure. Although still filled with challenges, the procedure is well accepted around the world and is being performed more often. However, not enough human hearts are available from organ donors. Today's sophisticated electrocardiograph (ECG or EKG) began JL with the study of frogs' legs. During the 1700s, scientists Luigi Galvani (1737-1798) and Alessandro Volta (1745—1827) used frogs to study muscle action. Their work led to development of the galvanometer (gal-va-NOM-e-ter), which measures current by electromagnetic action. In 1903, William Einthoven (1860-1927) introduced the string galvanometer. Einthoven's galvanometer evolved into today's EKG machine, one of the fundamental tools that cardiologists use to monitor the heart's rhythms. Coronary heart disease is the largest killer of American men and women. Every 29 seconds someone suffers a coronary problem; every minute someone dies from one. Managing heart failure costs Americans between $10 and $15 billion annually. Almost 15,000 heart transplants have been done since the 1980s, according to the United Network of Organ Sharing. About 2,500 are performed each year, with many other patients waiting inline. Convenience stores, cafeterias, and snack bars used to post warnings near their microwave ovens for people with pacemakers. Electromagnetic radiation emitted from the microwave ovens sometimes caused current variations in the pacemakers. Pacemakers today are shielded from stray electromagnetic forces and have a backup mode in case of disruption of the main circuit's programming. Heart disease often represents a turning point in a person's life. People who formerly led unhealthy, mainly inactive lives may be inspired to change the way they live by eating more healthily, exercising regularly, and quitting smoking. In the case of a heart attack, full recovery generally takes about four to six weeks, depending on the extent of the injury, the patient's overall health, and the condition of the rest of the heart. Most people are able to resume regular activities within a few weeks or months. Like all patients with heart disease or damage, those who have had heart attacks need to adopt a healthier lifestyle, including eating a low-fat diet. Most go on to recover and enjoy many more productive years of life. Reduce total dietary fat to no more than 30 percent of total daily calories. Reduce dietary saturated fat and cholesterol: switch from whole to skim milk, reduce the number of egg yolks eaten, avoid solid cooking fats like lard, give up foods containing certain vegetable oils such as palm or coconut oils, and substitute frozen yogurt, sherbet, or ice milk for ice cream. Arnold, Caroline. Heart Disease. Danbury, CT: Franklin Watts, 1992. Describes the heart and circulatory system and both genetic and acquired diseases that can affect the functioning of the heart. American Heart Association, 7272 Greenville Ave, Dallas, TX 75231.